Finally, the moment that we have waiting for is finally here as the story and crew for the upcoming new rider hero is finally here! "It is the fall of year 2018, when a time machine appears before the protagonist born in 2000. Just what is the fate of the future?! 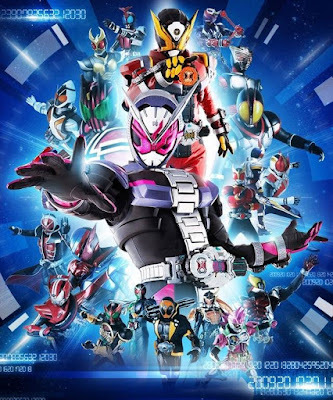 This is the story of the Kamen Rider who will fight to save the past, present AND future- fighting across time while encountering the past Heisei Riders across the course of history." As for the crew, the series will be headed by Kento Shimoyama (Goseiger & Ninninger), will be directed by Ryuta Tasaki (Kamen Rider Den-O, Kamen Rider W and Kamen Rider Drive) and will be produced by Shinichiro Shirakura and Naomi Takebe. The cast will be revealed this August 7th during it's series press conference. Wait a moment? is this another Kamen rider Decade genre? well all I know is that he is the 12th Kamen Rider base on his mask. Decade-ja-vu, anyone? I wonder how will the protagonist react to Decade, or if decade's main character actor will make a return. My last hope left is that this will actually prove me wrong, or we have a Megaforce-range disaster on our hands, maybe worse. So, a mixture of Decade and Gaim. Seems interesting. I hope Decade is the third rider in this season like Kuuga was in Decade. Well, his power-up form IS based on Decade so... Also, Kamen Rider Gates is a girl? And Decade who is about the same size Gates is, now why might that be? Perhaps Decade is a very major player on this show and I missed reading that but I can only speculate and assume with anticipation. Since Decade is the 3rd largest character on the poster, I hope he has a big roll to play. Maybe even the villan! Narutaki could have been right! its not 10 plus 2, its 10 times 2. 12th? He’s the 20th. 10 and 2 can also be 10:10. So for the 20th entry in the Heisei era and thirty-third entry in the franchise as a whole, they pick Kento Shimoyama. This is the guy who was the head writer of Ninninger, one of if not the worst season of Super Sentai, which is outright loathed by nearly the entire fanbase with those who do not hate this season simply viewing it with mild indifference at best. While I have a lot of issues with seasons such as Kyoryuger and Kyuranger, I could at least understand as to why they are so popular. It is baffling as to why Toei gave their big anniversary project to a writer who has already proved himself incredibly incompetent in the past. Maybe Shimoyama will surprise us with how much he has improved as a writer for the upcoming season, but as of now it feels like it is nearly dead on arrival. Considering a previous statement sounding like he was going to alt times to save the other KR, and one of the forms is actually Decade, I kinda hope so. Mostly because it was said they were doing like gokiager (spelling i know) and actually bringing back previous actors for their worlds/times. As to the reaction, it will be humorous I hope. Will Narutaki also be returning? How will he handle two destroyers? Decade + Den-O basically Den-O continuation?? more imagin? more Toshihiko Seki? Yeah, I'd like to see him interact with Tsukasa as well, since they're both "out of place"/passing through Kamen Riders. Zi-O is the 20th Heisei rider. Not the 12th.